As wide receiver Josh Gordon continues to learn the New England offense, he continues to find ways to contribute. It’s easy to get excited about Josh Gordon’s five-catch, 130-yard performance against the Green Bay Packers. It’s even easier when you consider that he and the New England Patriots are still scratching the surface of his potential with Tom Brady and this offense. Offensive coordinator Josh McDaniels talked Tuesday about how far Gordon has come in catching up to the rest of the offense since he was traded from the Browns. McDaniels praised the work that Gordon has put in, but stressed that he is “still in the growing phase” of acclimating him into the offense. 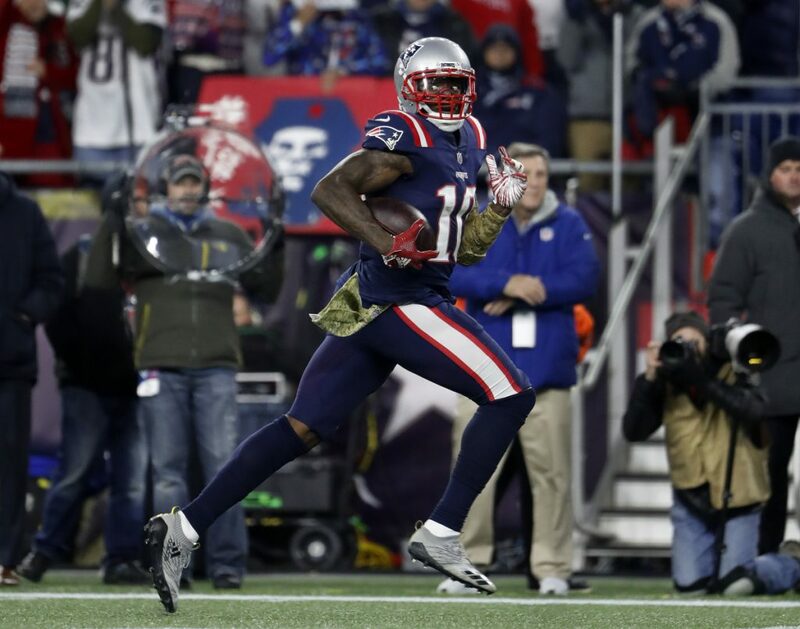 While the Patriots offense is known for being famously difficult for receivers to grasp, Gordon has bucked the trend and is getting targets from Brady in key situations. The Patriots expect their receivers to read the defense and change their routes based on what coverage is played. That way Brady and the receiver are on the same page in getting the ball in the right place on a given play. Gordon didn’t suit up for the Patriots until Week 3, but has already worked his way up to third on the team with 396 receiving yards, tops among wide receivers. The Patriots know what kind of talent and potential they have in Gordon and they’re clearly doing everything they can to draw it out as the season goes on. On Sunday, Gordon goes up against Malcolm Butler and the Tennessee Titans. STEELERS: Quarterback Ben Roethlisberger sat out practice on Tuesday to give his broken left index finger a rest but he is expected to play on Thursday night when Carolina visits Heinz Field. The 36-year-old is on pace to top 5,000 yards passing for the first time in his career. GIANTS: Rookie quarterback Kyle Lauletta apologized Tuesday, a week after he was arrested for motor vehicle violations near his home in Weehawken, N.J. According to police accounts, Lauletta was driving his 2017 Jaguar on Oct. 30, when he was stopped for failing to obey a police officer’s order to continue driving straight. • Eli Manning will start at quarterback for the Giants on Monday night and Coach Pat Shurmur is hoping the result of that game will lead to his no longer having to make such proclamations. This one was necessitated by the Giants’ 1-7 record, the offense’s inability to score points in the red zone, and a door that Shurmur left open before the team departed when he gave a “we’ll see” about Manning’s role moving forward. 49ERS: San Francisco is sticking with Nick Mullens at starting quarterback against the New York Giants. Mullens was sharp in his debut after spending his first year-plus on the practice squad as an undrafted free agent out of Southern Mississippi. He completed 16 of 22 passes for 262 yards, three touchdowns and no interceptions for a 151.9 passer rating in a 34-3 victory over the Oakland Raiders. LIONS: Detroit waived running back Ameer Abdullah after 31/2 seasons to make room for free-agent wide receiver Bruce Ellington.